The home of Jeremy Eberhardt and Ember Kalama, located in Fox, just outside Fairbanks. Eberhardt says that for him, using wood for fuel is about more than just saving money; it’s part of his Alaskan upbringing. (Courtesy of Jeremy Eberhardt). Interior Alaska is known for extreme cold in the winter. But because Fairbanks doesn’t have easy access to natural gas, most people use pricey fuel oil to heat their homes. And as a result, many families turn to a cheaper local resource to bring down their heating bills: wood. But wood contributes to an air quality problem that has Fairbanks in trouble with federal regulators. Even with the downsides, one family says that wood is still their best option. Jeremy Eberhardt and Ember Kalama live about 10 miles outside of Fairbanks with their four kids. Kalama moved here from Hawaii when she was in her teens, but Eberhardt was born and raised here. 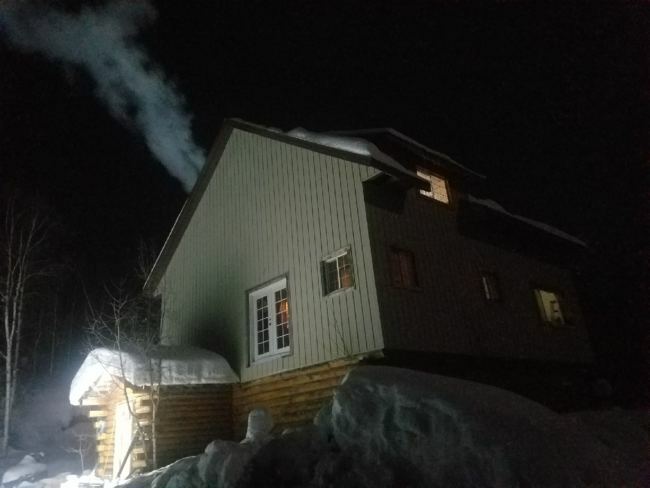 He calls 20 below “T-shirt weather.” And he says burning wood for fuel is about more than just saving money; the whole process of chopping, drying, and hauling it is part of his Alaskan upbringing and something he’s teaching his kids. But money is definitely part of it too. Kalama works in the plumbing industry, and Eberhardt is a mechanic. They say their income varies year to year, and it would take a real bite out of their budget if they were paying for heating fuel. They did heat their home that way several years ago and Eberhardt says it cost them at least $700 a month. The price of oil has gone down a bit since then, but Eberhardt says wood is still a lot cheaper. The only money they spend is on chainsaw and truck fuel and minor maintenance costs — less than $1,000 a year. They get the trees from their property or a nearby homestead that belonged to Eberhardt’s grandfather. 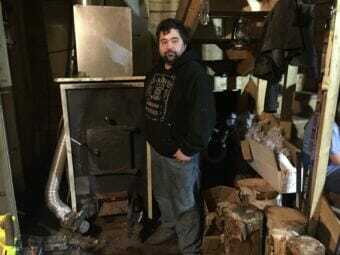 Jeremy Eberhardt standing next to his family’s forced air furnace – it burns wood and distributes the warm air throughout the house. (Ravenna Koenig/ Alaska’s Energy Desk). The part of the Fairbanks area where Eberhardt and Kalama live is a bit north of town — it’s not where the air quality issue is the worst. Even so, Eberhardt acknowledges that it’s a problem. But he also says that part of what makes the situation so bad is that people are burning wet wood. “We have a lot of people that sell wood in the Interior that… aren’t taking care of it, and aren’t seasoning it properly,” Eberhardt said. “And in the midst of the winter when it gets cold and there’s a lot of people begging for firewood, these people are popping up going ‘oh, I got all this dry wood’ you know and it really isn’t,” he said. He wishes more wood sellers and users would take the time to properly dry the wood. Eberhardt and Kalama don’t use an average wood stove to heat their home. On the bottom floor of their house they have a forced air furnace — a big hulking thing about the size of Eberhardt himself — connected to a duct, which distributes the warm air throughout the house. On a typical day, Eberhardt says he adds wood to the furnace about three times. He says on the days when the temperature dips well under zero, he gets a feeling of satisfaction, knowing how hard he worked to keep the house warm.